Refinery catalysts are widely used in petroleum refineries owing to their property to alter the rate of chemical reactions. Apart from this, it also enhances quality of gasoline products produced through FCC and hydro-processing. Refinery catalysts market are known to minimize the adverse effects of gasoline and diesel on the environment. This is because they help in removing sulfur from crude oil. The growth in the global refinery catalysts market is mainly attributed to stringent government regulations on the use of crude oil products. As per a research report by Transparency Market Research, the global refinery catalysts market is likely to reach a valuation of US$11.4 bn in 2015. The market is projected to expand at a steady CAGR of 4.60% from 2016 to 2024. Rising at this CAGR, the global refinery catalysts market is anticipated to reach a valuation US$17.0 bn by the end of the forecast period. The global refinery catalysts market is classified on the basis of refining unit, material, and physical form. In terms of refining unit, the global refinery catalysts market is segmented into fluid catalytic cracking, hydrocracking, H-oil, hydrotreating, catalytic reforming, and alkylation. Among all them, hydrocracking catalysts segment of the refinery catalyst market is projected to display a highest CAGR during the forecast period. This is because, it has a higher demand across all end user industries owing to its general characteristics. In addition, hydrotreating does not produce coke as a by-product, thereby resulting in the improved conversion of feedstock. On the basis of material, the global refinery catalysts market is segmented into zeolites, molybdenum, cobalt nickel, others (including platinum, etc.). Among all of them, the cobalt nickel segment accounts for the largest share of the refinery catalyst market. This is because they are primarily used to remove unwanted impurities from diesel and petrol into the environment. Apart from this, they are also used in desulfurization and denitrification processes. As the demand for fuels containing less sulfur content increases, the demand for metals is anticipated to witness steady growth in the near future. In terms of region, the global base oil market has been divided into North America, Europe, Asia Pacific, Middle East & Africa, and Latin America. Among all of them, Asia Pacific is projected to account for the largest market in the overall refinery catalysts market. This is because of the presence of key consumers, which includes countries like India and China. The increase in demand for transportation fuels in these countries have contributed to the growth of the refinery catalyst market in this region. The leading players operating in the global refinert catalysts market are Sinopec Corp., ExxonMobil Corp., Royal Dutch Shell Plc., and Chevron Corp.
One of the main considerations driving the development of the refinery catalysts market examined is the expanding interest in refineries. The quickening interest for higher octane fuel in the market additionally ascribed to the development of the refinery catalysts market. On the flipside, the instability in valuable metal costs are relied upon to impede the refinery catalysts market development. Refinery catalysts are utilized by oil refineries in the breaking procedure. Global refinery catalysts market is principally determined by the expanding interest for cleaner oil based goods. In light of sort, the refinery catalysts can be classified into seven portions in particular isomerization catalysts, liquid reactant splitting catalysts, hydro handling catalysts, alkylation catalysts, hydrodesulphurization catalysts, and hydrogen fabricating catalysts. The key crude materials utilized in the assembling of refinery catalysts are metals, zeolites and synthetic mixes. Hydro preparing catalysts are utilized to make cleaner powers and have most noteworthy development rate among refinery catalysts. 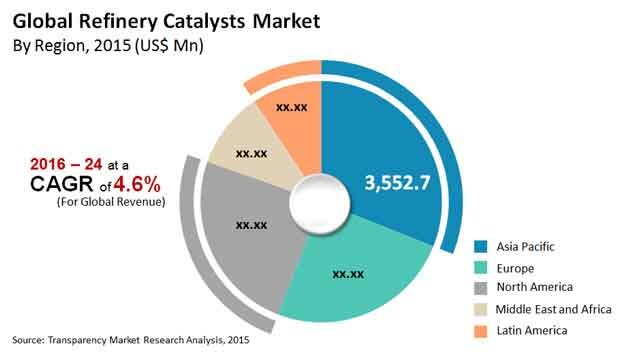 Liquid reactant splitting catalysts' market is developing towards development and losing its market share which is picked up by different sections of the refinery catalysts market. In Nov 2017, a disintegration understanding has been marked between Evonik India Pvt Ltd, and Ravindra Heraeus Pvt Limited to end the association for contract assembling of valuable metal catalysts and refining of spent catalysts from 31 March 2018. A developing number of acquisitions and mergers, expanding in the quantity of associations and joint efforts, and item dispatches are the most recent patterns of the global refinery catalysts market. A portion of the main players join W.R. Effortlessness and Co., Haldor Topsoe, Johnson Matthey, Honeywell, Evonik Industries, BASF SE, Albemarle, and Exxon Mobil Corporation. These organizations know enough about advancement of various examinations in the bundling, and are eager about defending these innovations to pass on singularity to their item advertising. Heightening vitality request, natural guideline, powerful interest for impetus in compound union, expanding interest for polymers, solid development of refineries are factors driving the development of refinery catalysts market. Indistinct strategy for impetus transfer and surprising expense of impetus age may limit the development of refinery catalysts market. Catalysts with improved and upgraded execution like zeolite is required to affect the interest for refinery catalysts. The refinery catalysts market development might be obstructed by the gradually rising ubiquity of interchange wellsprings of vitality, for example, gaseous petrol, solar vitality, wind vitality, and other distinctive inexhaustible sources. Unrefined petroleum is known to have gigantic carbon impression driving ecological harms over the world, which is inciting numerous associations to search for eco-accommodating alternatives. These elements may diminish the reliance on raw petroleum items, thus influencing the refineries around the globe, thusly hampering the refinery catalysts market over the coming years. Asia Pacific, Latin America and Middle East are seeing high development in the refinery catalysts market because of expanding utilization of oil-based commodities. The expanding interest for gas and ultra-low sulfur diesel has been driving the refinery catalysts market. The expanding utilization of oil feedstocks in the ventures, for example, ethylene, propylene and butadiene in North America are making development open doors for the refinery catalysts market. The refinery catalysts market is progressively delivering all the more testing feedstock creations regardless of insecure fuel costs. Fixing ecological guidelines and expanding interest for diesel are supporting the development of hydro preparing catalysts.